A spruce tree with two sleeping squirrels travels from Cape Breton to Boston as a Christmas gift. The journey brings them through Halifax by ship to Saint John Harbour, then by transport truck into the United States. Undiscovered at customs, the squirrels stay with their tree for the long journey until the truck stops in Boston. They begin to explore the city in search of a new tree to call home, arriving in Boston Commons just as their spruce tree is lit for Christmas. (Editor’s Note: The people of Halifax gift a Christmas tree to the city of Boston each year as a thank you for the help they received after the Halifax explosion of 1917). 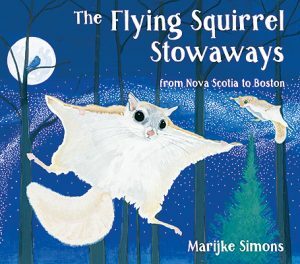 Curriculum Connections: Teachers can use this picture book in countless ways: to discuss human interactions with natural habitats; to investigate cultures, traditions, ceremonies, and celebrations; to introduce Canadian and American history and icons, and to explore trees’ varied roles in our lives. Great for: read aloud, mapping (setting), discussion of habitats, cultures and traditions, travel. Reading Comprehension Strategies: Predicting, Questioning, Making Connections.